According to Buzzfeed news, Advertisers who want to run advert through Twitter promoted sticker campaigns on Twitter platform will have to spend at least $500,000 to do it which after converting it to Naira @N300 to $1 the total goes at N150,000,000. Me after converting it to Naira, I be like: O boy!! 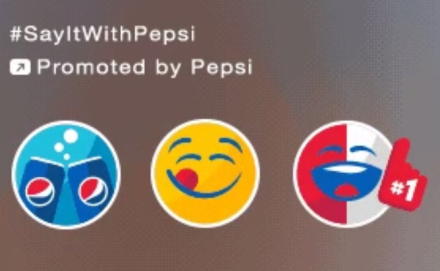 See figures..
Pepsi ran the first Promoted Sticker campaign. According to a Twitter, $500,000 [N150million] is the minimum amount to use in running this particular advert and from the $500,000, Advertisers can spend from it to run other Twitter ad products. Whatsapp Want To Share Your Information With Facebook But You Can Stop Them.